Virgil van Dijk has been ruled out of the Netherlands’ clash with Belgium after aggravating his recent rib injury. 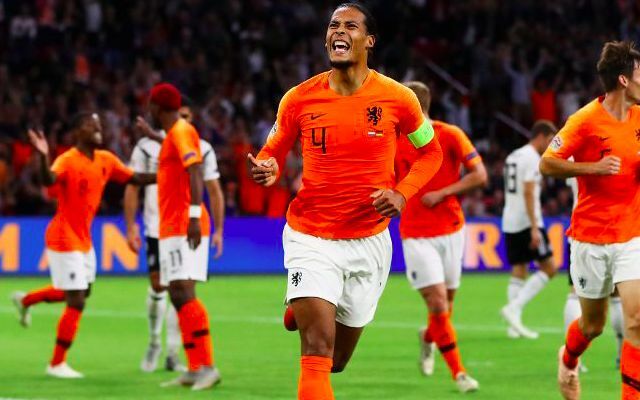 The Dutch captain will not travel as part of the 23-man squad after scoring in Saturday’s 3-0 UEFA Nations League win over Germany. Van Dijk endured a short spell on the sidelines late in September having been forced off in some discomfort during Liverpool’s 3-0 win over Southampton. He will now return to Merseyside in view of facing Huddersfield Town when the Reds continue their Premier League campaign on Saturday. Van Dijk refused to let injury rule him out for too long last month, stressing the need to play through the pain. His withdrawal will hopefully grant him the extended rest he needs in order to feature at the weekend, although Liverpool will feel they are equipped to fare without him if necessary. Dejan Lovren produced an assured display after returning to the starting lineup against Manchester City, whilst Joe Gomez has shown no signs of slowing up in his outstanding start to the campaign. Mohamed Salah has meanwhile also returned to Liverpool after suffering a muscle injury during Egypt’s 4-1 African Cup of Nations win over Swaziland on Friday.